﻿The Assabet River was offering the fastest route through Maynard this afternoon. 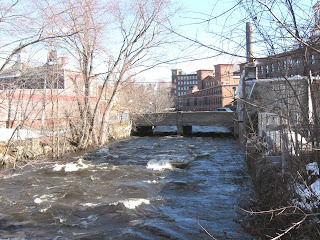 Last night's heavy rain combined with two days of snowmelt have given the river a heavy workload and she's not slowing down in the slightest, as she races under Main Street. For folks with the right boat and paddling skills, I imagine this looks tempting. I, on the other hand, prefer things a little more sedate. Looks good - except for that low bridge. Its a good time to be careful on the water.